Press Release posted 2/10/14 – With Valentine’s Day fast approaching, there’d be no better gift than tickets to the 44th annual Friends of the Sierra Madre Library Wine and Cuisine Tasting. Being held on Friday evening, February 21, 2014, at Alverno Villa, 675 West Highland Avenue, Sierra Madre, CA., the event will be an elegant affair featuring more than two dozen vintners providing superb wines and local restaurants offering delectable hors d’oeuvres and desserts. Tickets to the premier event are $80 and allow you early admission at 6:00PM. You will be treated to a wine tasting with a local sommelier, specially selected hors d’oeuvres, and a unique raffle. Tickets to the premier event are limited to 100 guests and are going fast so act quickly to enjoy these exceptional activities. Tickets to the main event are $60 and provide admission at 7:00PM. You will enjoy quality wines from a number of award winning wineries and tastings from many fine local restaurants. We are limiting the number of tickets sold to 400 to add to your enjoyment. Tickets to both the premier event and main event are on sale at the Sierra Madre Library, the Bottle Shop, Savor the Flavor, and Arnold’s Frontier Hardware. Throughout the evening you will enjoy live music as you stroll about the lovely grounds of Alverno sampling the wonderful wines and appetizers. Magic Castle magicians will add to your entertainment and pleasure. Steve Silverman has performed nationwide in a variety of venues and his sophisticated sleight of hand has been enjoyed by hundreds of people. He creates much of the magic he performs and his ideas and effects have been featured in magic books and periodicals. He will be joined by another long standing magician member of the Magic Castle in Hollywood and a Sierra Madre resident, Steve Rockwell. Mr. Rockwell has a strong interest in sleight of hand magic and community support and this year will mark his third appearance at the wine tasting. A silent auction will again feature lovely artwork, services, tickets to special events, restaurant vouchers, and many other tempting items. 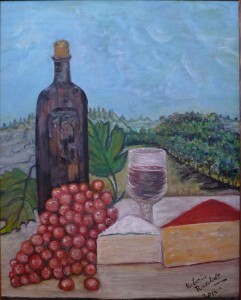 An item of note is the original artwork created for the wine tasting by Victoria M. Randall. Ms. Randall was born in Athens Greece and has lived with her family in Sierra Madre for forty-two years. She has produced art in many different mediums including oil, water color, wax encaustic on wood panels, charcoal, clay, stained glass, and bronze. She has sold many pieces of work to local and foreign buyers and is recognized as a natural and classical Greek artist by her peers. For a delightful evening of enjoying fine wines, tasty food, and lively entertainment amidst the company of friends, joins us at Alverno Villa on February 21, 2014. The Friends of the Sierra Madre Library is a non-profit organization and all proceeds benefit the Sierra Madre Library. For more information visit the Friends website at www.sierramadrelibraryfriends.org , or call the library at 626 355-7186.